This webinar will introduce the LEED 2009 for Healthcare Rating System which was released in November 2010. 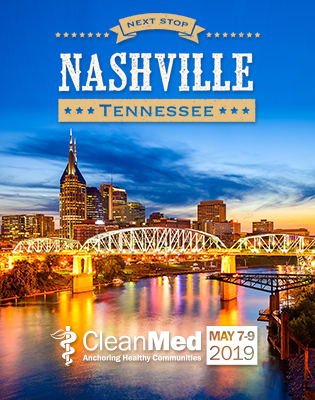 The presenters will discuss the development of the LEED for Healthcare Rating System, the business case for pursuing LEED certification for a healthcare facility, and give an overview of the new and modified healthcare-specific credits. The LEED for Healthcare Rating System is designed to guide and distinguish high-performance healthcare projects, including inpatient and outpatient care facilities and licensed long term care facilities. It may also be used for medical offices, assisted living facilities and medical education and research centers. LEED for Healthcare addresses design and construction activities for both new buildings and major renovations of existing buildings. This webinar will provide users with tools and resources to learn more about the rating system and determine if LEED for Healthcare is right for their project. Melissa Gallagher-Rogers, Director LEED for the U.S. Green Building Council acts as the primary liaison to Federal, State and Local government agencies as well as health care facilities as they green their building portfolios by implementing the LEED Green Building Rating System. Melissa is also responsible for th development of the LEED for Healthcare rating system and the suite of resources that support it as well as creation of programs that facilitate peer to peer interaction within these crucial markets. This includes the development of tools and resources specific to the sectors as well as speaking at conferences across the country to provide education on green building. Ms. Gallagher-Rogers began her career as a Presidential Management Fellow (PMF) with the Department of Energy’s Office of Energy Efficiency and Renewable Energy. As a program specialist with DOE’s Weatherization Assistance Program, she set policy on health and safety specifically on lead paint and mold growth in housing. Steve Guttmann served as Chair for U.S. Green Building Council’s LEED for Healthcare Core Committee. For the past seven years, he has been actively involved in developing LEED for Healthcare – the USGBC Rating System for best practices for sustainability in healthcare facilities. He has also served on the Steering Committee of Green Guide for Health Care, for which he wrote the Energy Optimization credit and is currently leading the Carbon/Energy Task Group as co-chair. A dedicated educator and a strong advocate in greening hospitals, Steve is not only an award-winning engineer of innovative solutions but also a frequent speaker at international and regional conferences promoting green healthcare design practice. He was the Keynote speaker at Hospital Design and Upgrade in Dubai in 2010 and led a 2-hour pre-conference workshop for Green Hospitals in 2008. He also presented at American Society for Healthcare Engineering Annual Conference in 2005, GreenBuild in 2004 and 2006, and CleanMed in 2010 and 2008. Steve is a 1983 graduate of the University of California, Santa Barbara, with a B.S. with honors in Mechanical Engineering and a B.A. with honors in Environmental Studies.